The Madagascan banana: Could this save the world’s banana crop? A wild banana that may hold the key to protecting the world’s edible banana crop has been put on the extinction list. It is found only in Madagascar, where there are just five mature trees left in the wild. Scientists say the plant needs to be conserved, as it may hold the secret to keeping bananas safe for the future. Most bananas consumed around the world are of a type known as the Cavendish, which is vulnerable to a plant pest. The race is on to develop new banana varieties that are both tasty to eat and resilient enough to survive attack from Panama disease. 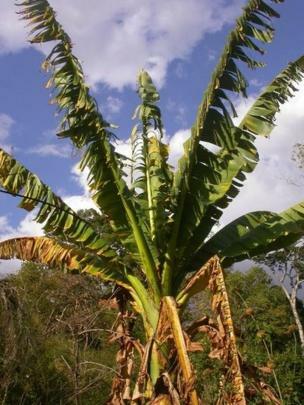 The Madagascan banana has evolved in isolation on an island cut off from the mainland, and may have special properties. Richard Allen, senior conservation assessor at the Royal Botanic Gardens, Kew, said the species (Ensete perrieri) could have in-built tolerance to drought or disease. “It doesn’t have Panama disease in it, so perhaps it has genetic traits against the disease,” he said. Kew scientists searched for the banana plant in Madagascar and found it was almost extinct in the wild. They hope that its inclusion on the latest official Red List of the IUCN (International Union for Conservation of Nature) will highlight its plight. Dr Hélène Ralimanana of the Kew Madagascar Conservation Centre says the plant is part of the island’s rich floral heritage. “It is very important to conserve the wild banana because it has large seeds which can offer an opportunity to find a gene to improve the cultivated banana,” she said. If the wild banana can be protected, there will be opportunities to collect the seeds and look at the plant’s genetic make-up. The Madagascan banana produces seeds within the fruit, which means it is not palatable to eat. But cross-breeding could lead to a new type of banana that would be both edible and resilient. The banana grows on the edge of forests, where it is vulnerable to damage from severe weather events as well as from logging, fires and the clearing of forests for farming. Why are bananas vulnerable to disease? Bananas are clones – which means they are all the same. So, if the disease is present in one plant it can spread quickly throughout the whole population. That is the case for now, but it may not be so in the future. The disease affecting the Cavendish is currently confined to Asia, but if it were to spread to the Americas, it could wipe out the world’s banana crop. This actually happened in the 1950s with a type of banana known as the Gros Michel (often known as Big Mike). The song, “Yes! We Have No Bananas,” is said to have been inspired by a shortage of Gros Michel bananas, which began with an outbreak of the fungus behind Panama disease. Gros Michel bananas were replaced by Cavendish bananas, which are named after William Cavendish, the 6th Duke of Devonshire, who lived at Chatsworth House in Derbyshire. Bananas have been grown at Chatsworth since 1830 when head gardener Joseph Paxton propagated a specimen imported from Mauritius. Nearly every banana now eaten is directly descended from this plant. 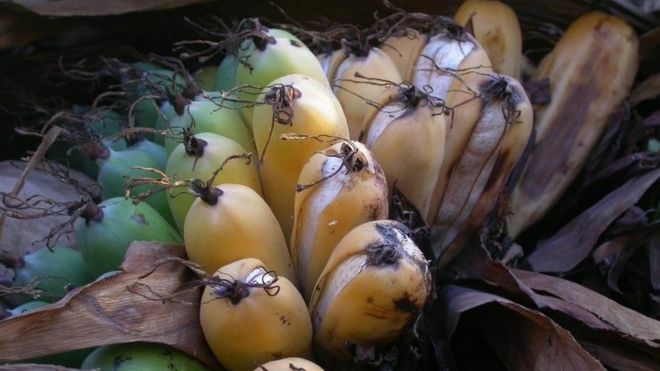 What do we know about the Madagascan banana? It goes by the scientific name, Ensete perrieri, and is listed as Critically Endangered. It is found in the tropical forests of the country’s western region where it is under threat from deforestation: only five mature trees are now reported to remain in the wild.